This book wrapped itself around my heart, and squeezed and squeezed and squeezed! It had emotional angst, romantic tension, and life altering decisions that threw everyone, (including me) for a loop. I seriously didn’t see it coming…but then again, I never see it coming 😉 This was THE best book in the series, and one of my favorite books of the year. I would, however recommend that you read the first two before hitting this one, to get an idea of everything Meg has been through up until now, and to develop an attachment to the characters like I did. Following the series properly will allow for the reader to get the best possible “oomph” when they finally get to the part that rocked my world. You’ll be so emotionally invested by then, that you’ll feel every sting. For anyone who read Stacia’s Downside series…remember that turmoil? You know…when that thing happens, and made the characters feel so real? Stacia did it here, too (different circumstances, but the feeling felt just as raw, to me). Okay, so while this book felt at first like it was off to a slow start, close to halfway through, it picks up speed and doesn’t relent. Megan is stressed. In one day, she gets hit with a triple whammy. on her way home she is shot with deadly poison dart (and only survives that because Greyson was already there to save her). But the show must go on, and despite all of her personal issues, as head of her Meegra (her personal demon group) she must attend the very convention that the FBI are investigating, and pretend as if nothing is out of the ordinary in the face of all of the other Demon Leaders. While there, during one of their first formal dinner gatherings, she realizes that the FBI agent that visited her, is nosing around the hotel. Megan quietly leaves the table to try and circumvent her in some way (it just wouldn’t do to have a human FBI agent amongst all of gathered demons). As she follows the FBI agent, the agent is attacked by something?, and shortly thereafter, so is she. While she almost killed (almost thrown off the roof of the hotel), she manages to retaliate and stop the supernatural being with her psyche-demon powers. Not wanting to alert the other Demon leaders, Greyson, Megan and crew return to the table as if nothing happened, and determine to investigate the situation themselves. They soon find out that the “exorcism convention” is nearby, and some humans (including the FBI agent) are suddenly acting mighty weird, as if they are possessed…but whatever it is, Meg and Greyson determine it’s not demon possession. Maleficarium gave Greyson a helpless look. Megan knew exactly what Greyson was thinking, at least. To leave at this point, before they’d seen anything unusual – or, rather, anything that went beyond the superdeluxe crazy and into the sort of supernatural crazy that had characterized the night before – would mean this had been a wasted visit, and they couldn’t afford to waste any time. She was acutely aware that somewhere out there someone was scheming to kill her, and she knew Greyson was too. On the other hand, the thought of Maleficarium being subjected to such a thing mortified her. How the hell would he fake his way through that? Of course, she, Greyson, and their friends seemed to be the only ones in the room who failed to see what a fantastic idea it was to let Maleficarium be exorcized. Malleus and Spud made incoherent mewling noises, they were laughing so hard. Yup…lots going on and that, my friends, was the sloooowww part ;). THAT was the first half of the book. The part that I was like, yeah yeah..okay whatever. LOL!! And then…I was emotionally assaulted by this book!!! I became obsessed, and felt positively possessed by the turmoil that follows. Megan quickly learns that maintaining her “human” status amongst the demon population is causing much hoopla amongst, well…all of them. She simply refuses to do the ritual that will cause her to become genetically demon, and officially make her one of them. Because of this, many of the head demons don’t trust her, and some consider her a danger to their group and to Greyson. She also learns that there are certain demon customs that are normally followed by the male leaders, and she discovers that while she thought she was familiar with her “new family”, and specifically the man she loves, she really doesn’t know any of them at all. She wondered if any sentence she’d ever uttered to herself had hurt more. No, it didn’t seem so. That was a personal best in the pain and misery department. Oh…and that little summary doesn’t even do justice to what she discovers. From here on out, girls, you’ll have a lump in your throat. You’ll be angry, you’ll change teams (a few times throughout), and you’ll root for her to do the things she shouldn’t do, and then be angry when she does them. LOL!! Oh it’s a mess. And I’m sure, you’ll *get* it. You’ll *get* her. After reading your review on Stacia Kane’s Downside series, me and my small work book club read it. Then, I went through Stacia Kane withdrawal and decided to pick up the Megan Chase series. 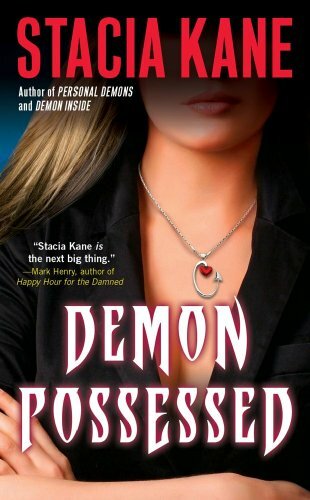 I’ve already read the first 2 and have only the last book, Demon Possessed, left. But, I’m not feeling that connection with Megan like I did with Chess, Terrible, Bump, Slobag, etc. Is the last book really, really worth reading? I don’t want to be bored, but I do want to finish the series as well. Advice?